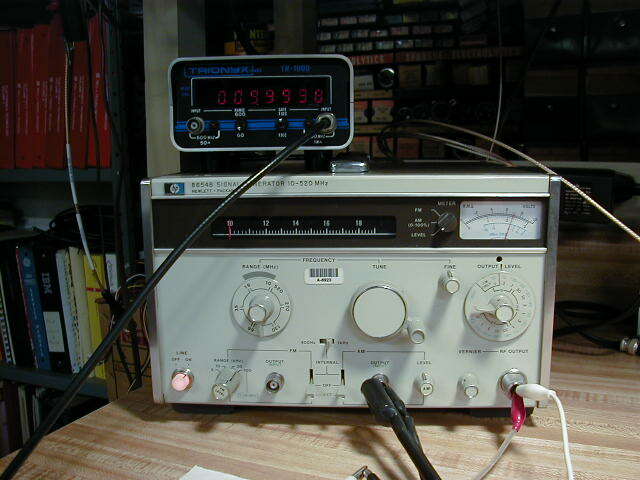 Over the years working in electronics it has always been a challenge for me to buy and accumulate good test equipment. As I have gotten older I have acquired a good oscilloscope, meters, audio generator's, frequency counters and good tools. One thing I have always wanted was a good service monitor with a spectrum analyzer. If you look around at hamfest, the Internet and electronic company's brochures, one can cost you from $1000 to $5000 used. So needless to say I do not have one. Last year at Dayton Hamvention I was walking by the Kanga booth and they had a box hooked up to an oscilloscope. Several other hams were looking at the device and one of them started talking about it. It turned out that it was a kit that Kanga sold, a spectrum analyzer. 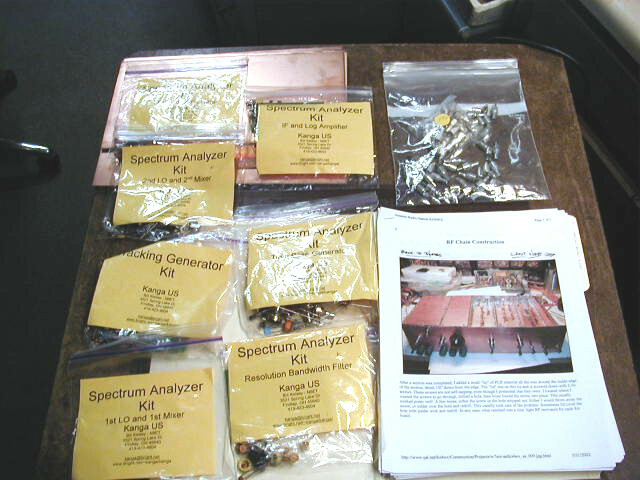 This spectrum analyzer (SA) was featured in the August 1998 QST magazine. The finished SA that we were looking at was Mike Boatright's KO4WX. He had dropped by the booth and gave us a great discussion of the project. Well, needless to say I started to get excited about the project and bought one. Kanga site is www.bright.net/~kanga/kanga/. I have now had it for 8 months and have not done anything with it. I have been working on other projects and wanted to keep this one for the winter time and this is three days after Christmas. So I need to get it out and get started. This project is not for the faint of heart. You get all of the parts and boards. 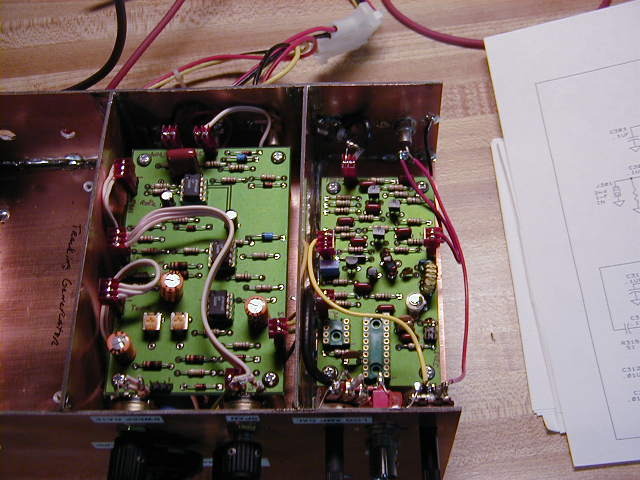 You must build your own RF isolated boxes or buy them and build or buy the enclosure. This also does not include the power supply, attenduator circuits, switches, connectors and cables. I started to work on the SA today 12/29/02. 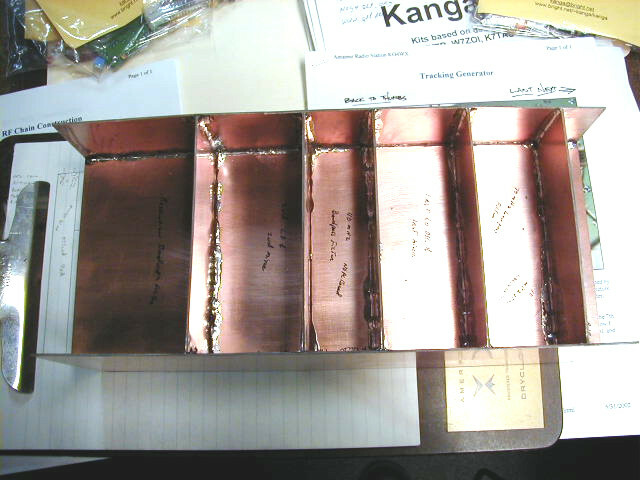 I began by laying out how the box was going to look. I use Mike's KO4WX design. Since each RF section needs to be isolated from each other. If you look at buying your boxes they are about $8 dollars per box, that is pretty expensive. All of the printed circuit board that I used was given to me. 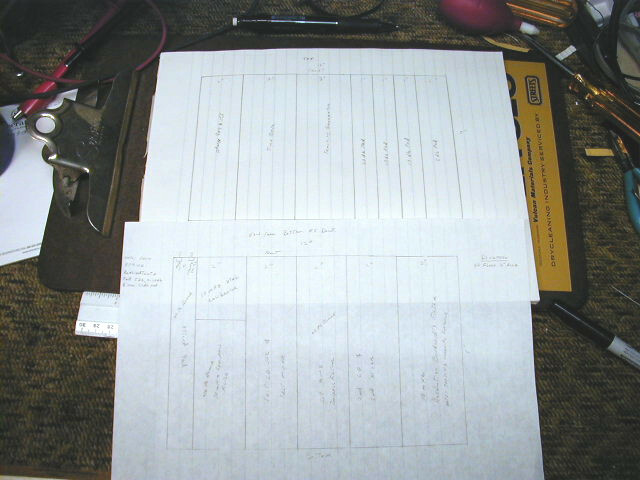 I first laid the design out on paper. It is not to scale. There is a lot of good drawing programs out there instead of drawing it on paper. I have Corel Draw that would of work just as good. This could give you a chance to hone your skills buy learning a new program. The following are some pictures of my drawings. I laid out the design for each RF section and started the process of cutting the printed circuit boards. Here is a picture of the shear that I used to cut the boards with. If you cut a lot of boards this device is great to use. It is actually 3 machines in one, a shear, brake and roll. 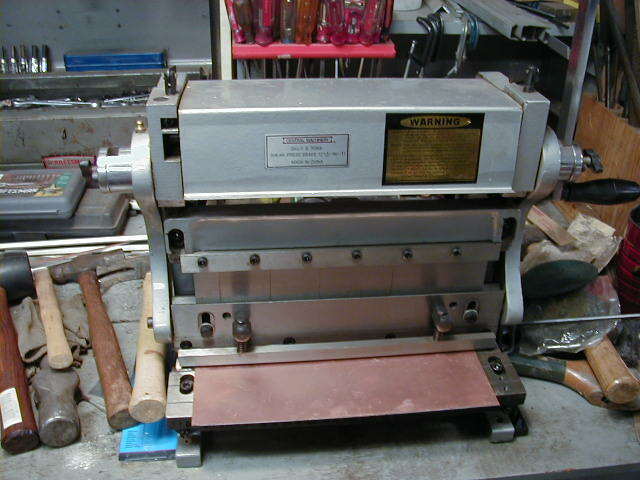 I also use this shear to make my metal boxes for other projects. The brake works well to bend the corners of the box into the desired shape. 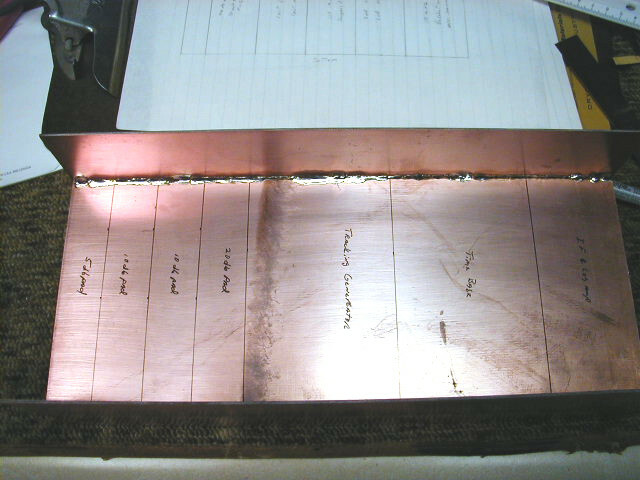 Here is a picture of my shear and the start of the shearing of the circuit boards. I now needed to start looking for/or build a power supply. The requirement for this project is +15 volts and -15 volts. I knew I had power supplies like these years ago when there was a lot of old mainframe and midrange computer equipment was on the market. These were machines that were built in the 70's and early 80's. I know that there is a lot of surplus computer equipment today but a lot of the older equipment had different voltage requirements that they do today. Normally most of the equipment today uses +5 volts and +12 volts. This Time Base Generator forms a free-running sawtooth generator and supplies an output to the X input to a scope and an output to the VCO. 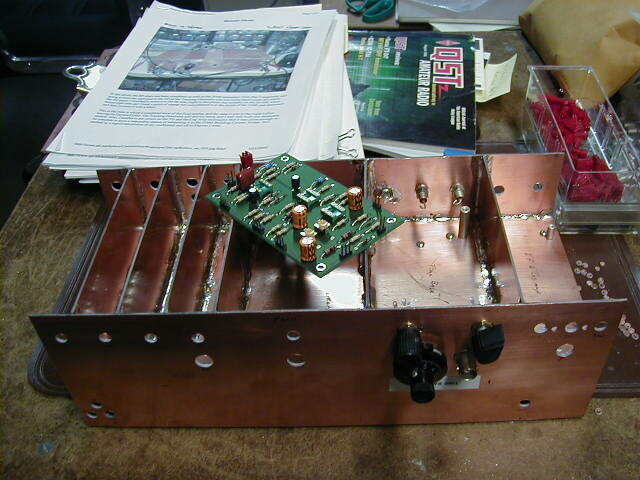 Today 2/19/2003 I finished building and putting the Log Amplifier and Detector in the SA. From the article it explains that central to any SA is a logarithmic amplifier. The need for logarithmic processing becomes clear if we consider the range of signals we want to measure. At the low end, we may want to look at submicrovolt levels under -107 dBm in a 50 ohm system. At the other extreme, we may want to measure the output of small transmitters, perhaps up to a power of 1 Watt or +30 dBm. The difference between the two levels is 137 dB. This is a wide dynamic range world and linear displays, such as our screen, are inadequate unless some form of data compression or logarithmic processing is used. Here is a picture of the Log Amplifier. 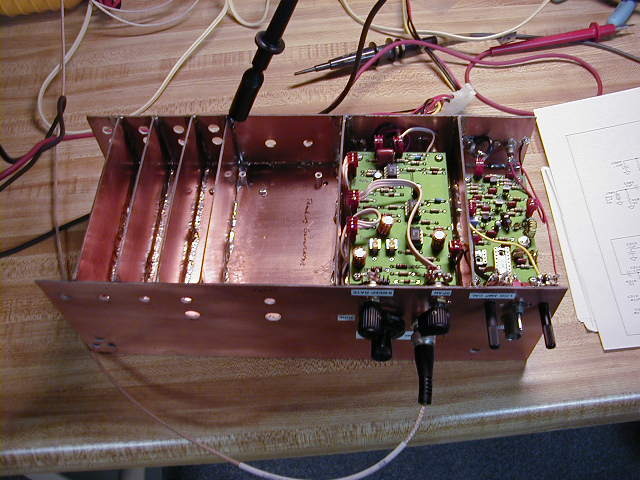 3/02/03 I finished calibration of the IF and Log amplifier. I did not think about it at the time but I have a MFJ - 259 SWR Analyzer. It has a RF output good up to 170 MHz so far it has made me a good signal source for 10 MHz. I was able to get the recommend results using it as a signal generator. After using the SWR Analyzer to align the SA I was surfing on eBay and did a search for signal generators. It must have been a stroke of luck because I found a HP8654B in my price range. 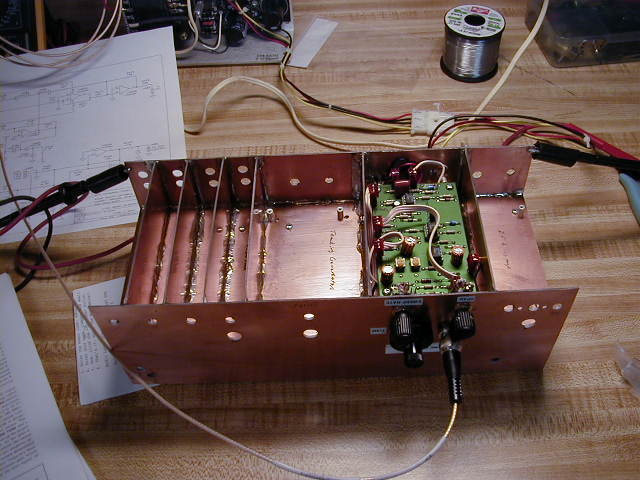 This is a RF Generator capable of frequencies between 100 kHz and 500 MHz. Before I bid on it I checked some of the use test equipment companies and found that I had gotten a deal, so it is on its way. I will give you an update on how it works when I get it. 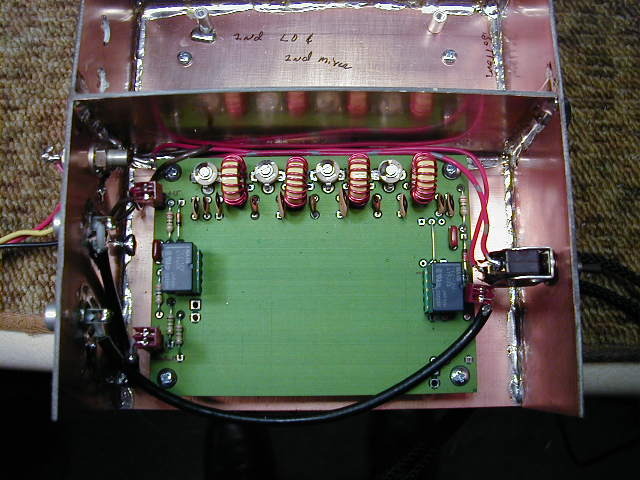 The next section that I started to build was the 300 kHz Resolution Filter. It has enough room on the printed circuit board to also build a 30 kHz crystal filter. 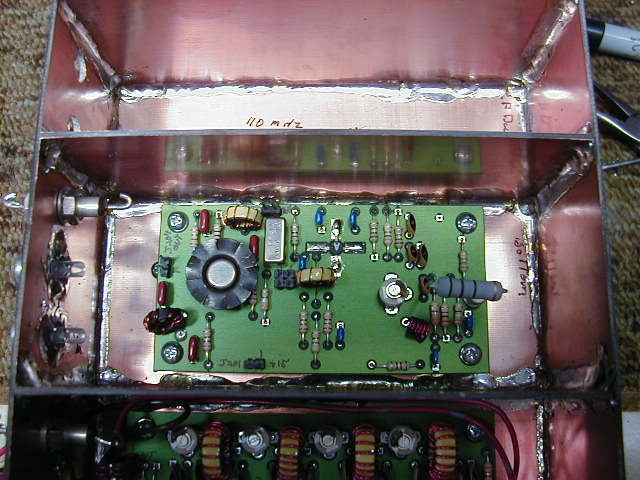 The kit does not come with the parts to build the 30 kHz filter. The author left it up to the individual to come up with their own design. I am going to just build the basic filter for now and get the SA up and running. By far this is probably the easiest board to build. The only thing that I had trouble with was I had no signal output when I tried to align it. When I finished the board I realize that there was some parts missing. After I went back to read the article I realized that the missing resistors were for an additional attenuator pad that can be inserted in line with one filter or the other to approximately equalize filter loss in the two paths. I just put a jumper in the place of R507. 03/09/03 The next section of the SA is the Second Mixer and Second Local Oscillator. From the article the author described the mixer and related LO. The heart of this module and to some extent that of the entire analyzer is U202, a high-level second mixer. This mixer is bombarded by large signals that are as strong or stronger than those at the front end. Accordingly, the second mixer should have intercept similar to that of the first mixer. (which I have not built yet) This is usually a weak point in all too many home-brew spectrum analyzers as well as more than a few receivers! The second mixer, U202, uses a +17 dBm level Mini-Circuits TUF-1H. 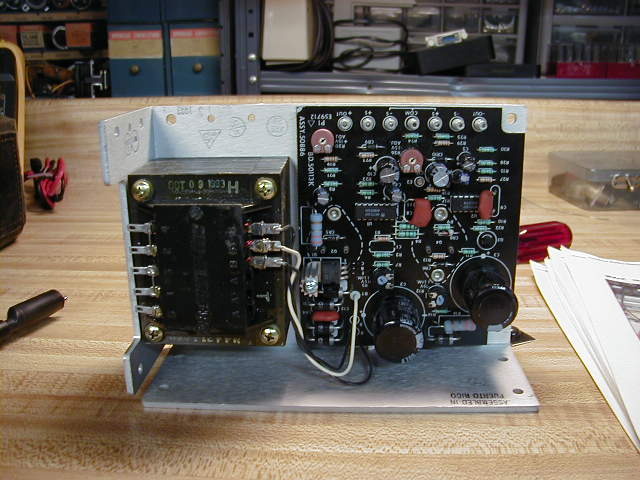 The second mixer is terminated in a high-pass/low-pass diplexer followed by an IF amplifier (Q202) BIASED AT 50 Ma. The second LO begins with a 100 MHz, fifth-overtone crystal oscillator, followed by a pad and power amplifier. The following is a picture of the finish board. I have not installed the 100 MHz crystal yet because the article described a way to align the oscillator with a 51 ohm resistor. 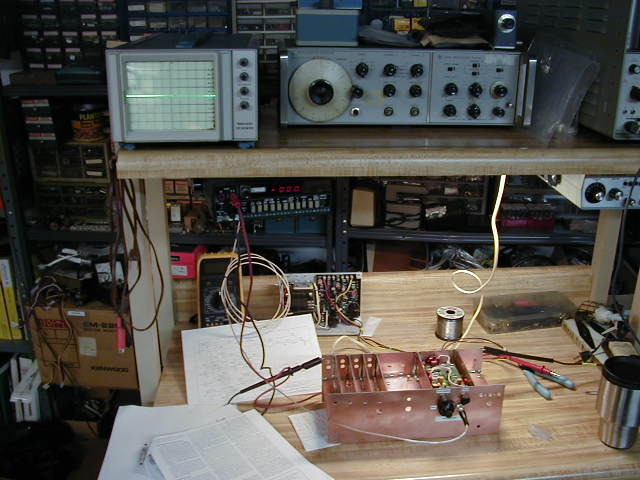 Adjust the tuned circuit until oscillation occurs at the desired 100 MHz frequency. 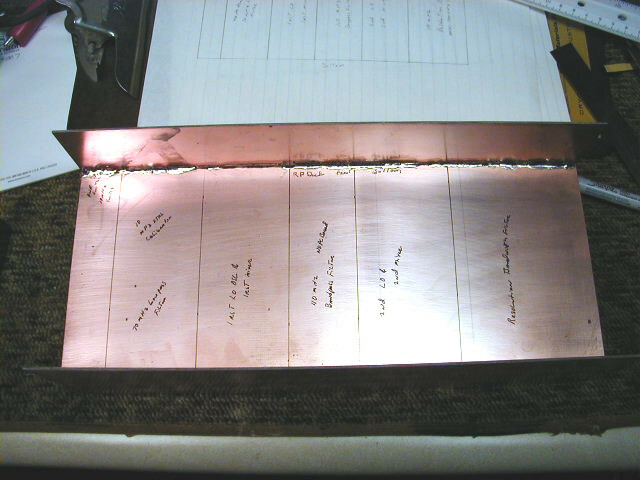 Then, replace the 51 ohm resistor with the 100 MHz crystal; no further tuning is required. Notice I also put a heat sink on the power amp. The article indicated that it gets quite hot. I believe it dispates up to 2.5 watts. Hope you have fun with this one also.